We were sixteen strong as we exited our cars at the North Loop trailhead on Deer Creek Road this morning. We had had a long wait at the Kyle Canyon Road construction so we were anxious to get started. The air was fresh and the sky was blue. 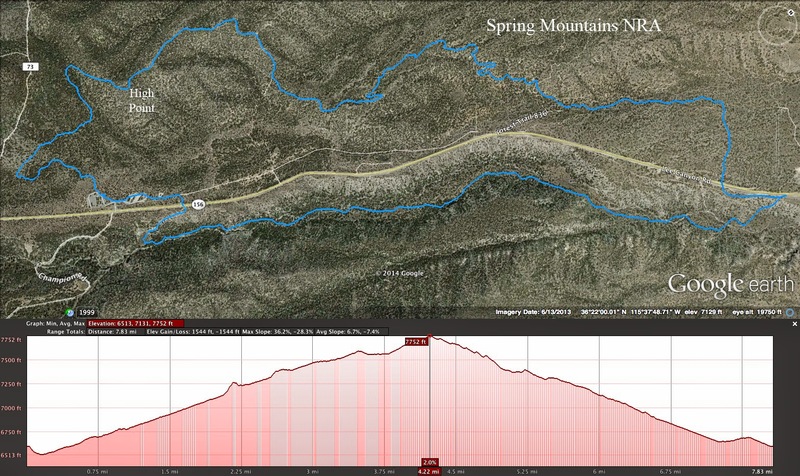 Perfect weather for a climb up to one of the Spring Mountains NRA smaller peaks called Fletcher. 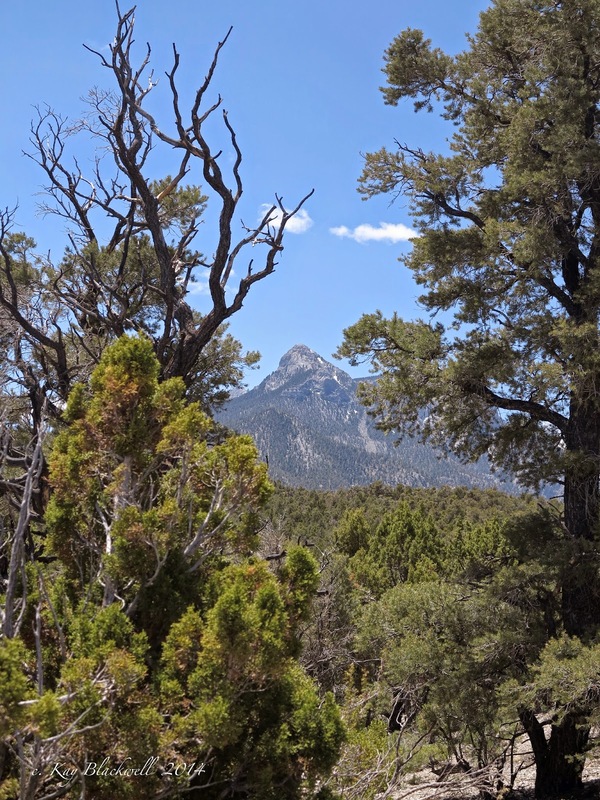 Fletcher Peak rings in around 10, 270 feet in elevation. This is considerably less than Mt. Charleston, any Mummy parts and Griffith Peak. The group started up the North Loop Trail and eventually separated as the different speeds and abilities took over. Our first regrouping would be at the meadow, we all knew. The meadow is 1000 feet up in elevation and 1.5 miles in distance. There is a log shelter built there and large views are all around. The prominent pointed mountain above us was Mummy's Nose, a difficult hike which is on the schedule in June. 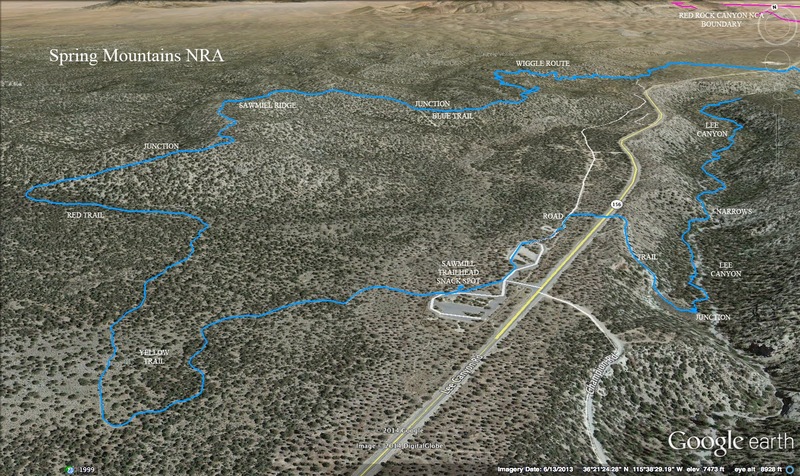 After a small rest, we turned to begin the twelve switchbacks that would take us up to the North Loop high point on this side of the Trail Canyon junction. Again, we separated but we could hear each others' voices from time to time. The high point would be our second gathering spot. It is here that we got our first view of Fletcher Peak as seen in the first photo of this entry. From the high point, the hike descends around 50 feet in elevation before the Fletcher Peak trail turns off to the left. We stopped again while we got word if the last two hikers were going to continue all the way to the peak. As it turned out, one hiker decided to wait back at the high point and return to the meadow. So, we stepped over the log and started around the hill. 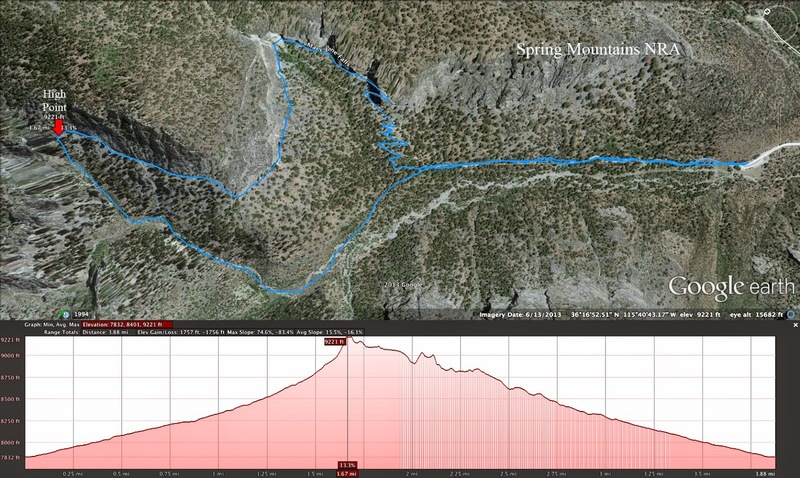 From there, we lost a lot of elevation (another 150 feet) going down to the saddle and connecting with the summit climb. 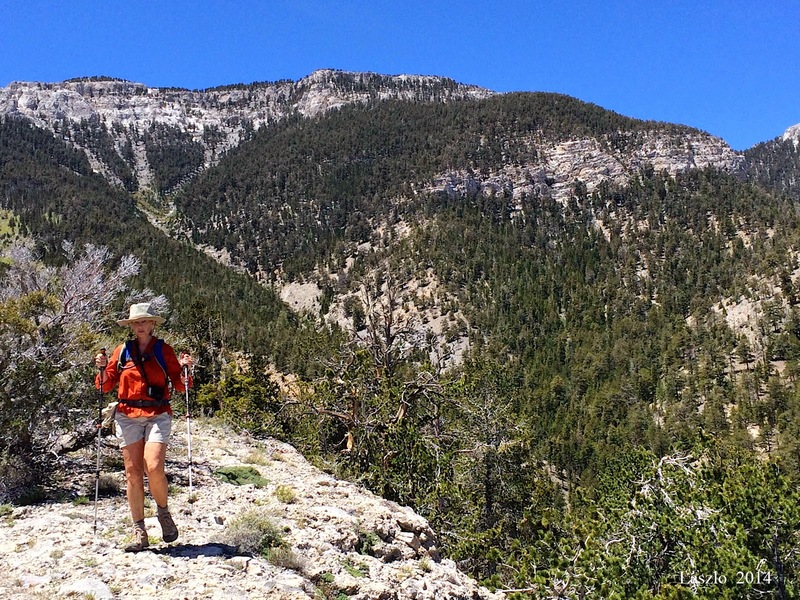 Over the course of the past seven years, the Fletcher Peak trail has improved greatly. It is now easy to follow whereas, before, it was anybody's guess! The views to the right of the trail were wide open from Mummy's Toe all the way to Harris Peak. Mt. Charleston is in there and, today, there is very little snow left on its slopes as you can see in the photo to the left. When the last hikers arrived on the peak, the log book was being circulated. We sat for a well-deserved snack break and took in the view. It is from this peak that the writer saw the best view of the fire and flood destruction from the summer of '13. It is amazing that the fire fighters were able to save the little community of Rainbow. The photo above shows the inlet of still green trees that are filled with nice mountain homes. After the break, we headed down. 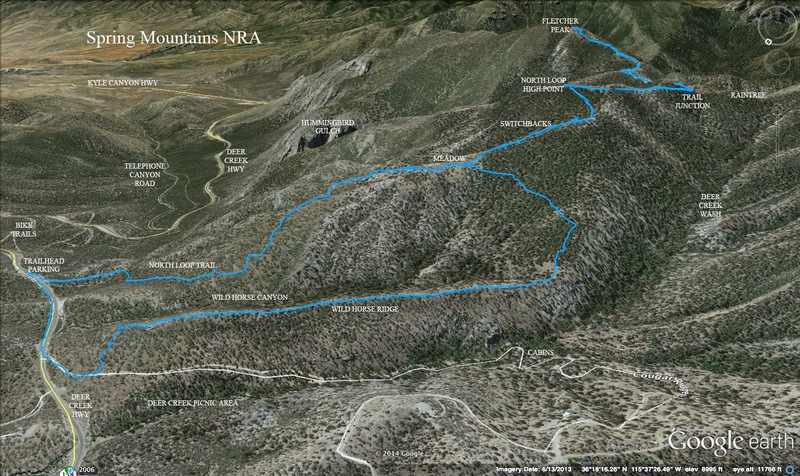 Fletcher Peak trail was followed by the North Loop trail and its switchbacks. At the bottom of the switchback section and just before we traipsed into the meadow, we hung a left onto the small Wild Horse Trail. 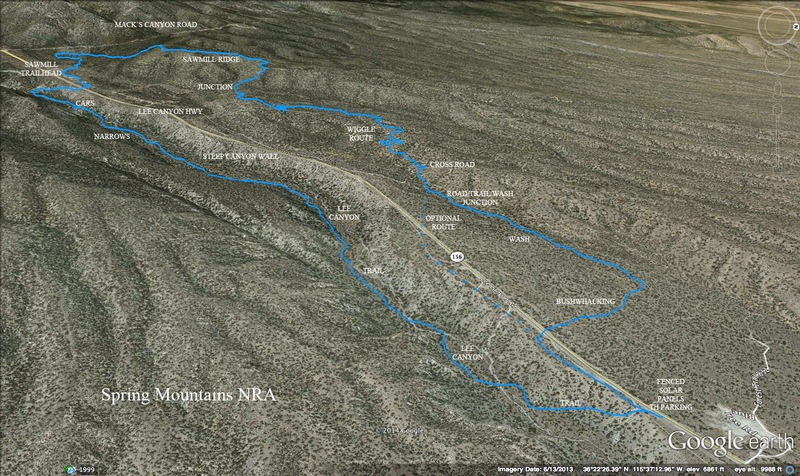 This wooded trail leads hikers to both a canyon and a ridge that are good options for descent. They are named Wild Horse Canyon and Wild Horse Ridge respectively. Today, we headed over to the ridge for an adventure. No one was really sure of the route even though we had been down the ridge several times so .... When we ran out of "small wooded trail" we bushwhacked down while knowing we were heading in the right direction! The trail is there somewhere, we knew. However, this was not a group that necessarily needed a trail! At any rate, we found the ridge right where we had left it. The ridge was, as always, very impressive sitting high above Deer Creek. We followed the length of it then dropped down off the end. Most of the group continued dropping all the way into Wild Horse Canyon while two others decided to take an easier route over to Deer Creek and down. Both groups hiked up the road to end the hike. A great morning was topped off with perfect pilot car timing at the construction on the way down! Avalanche Canyon is located between Mary Jane Falls and Big Falls. 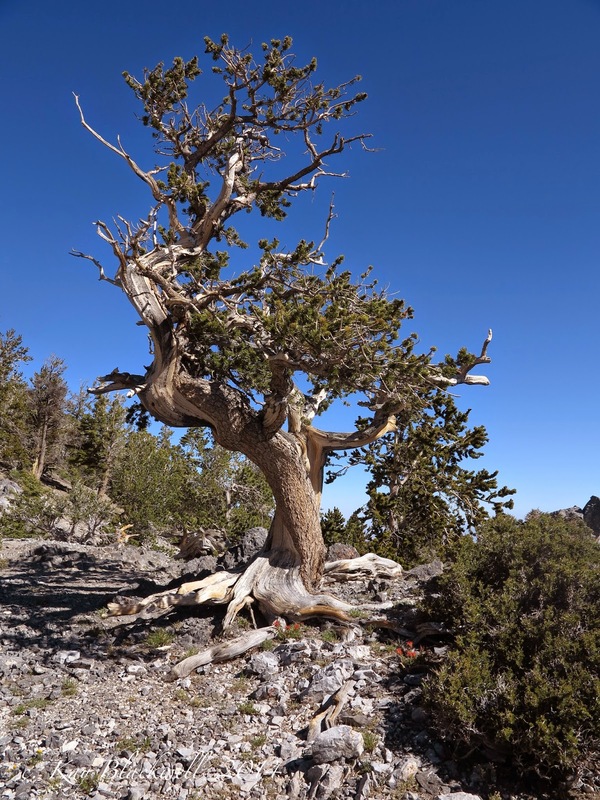 It emanates from high up the slopes underneath Mt. Charleston Peak. Every year, this canyon gets slaughtered with avalanches of snow and ice bringing down a few trees with it. There is a trail that takes hikers up through the wash and, for the most part, it is decipherable. 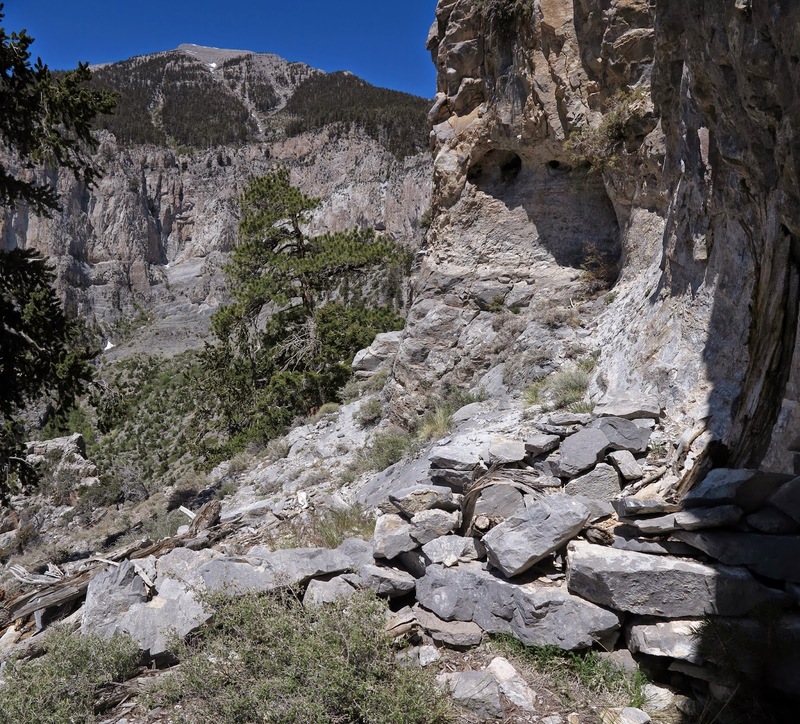 Seven hikers set out for a moderate adventure up this canyon and later found themselves on a strenuous hike! 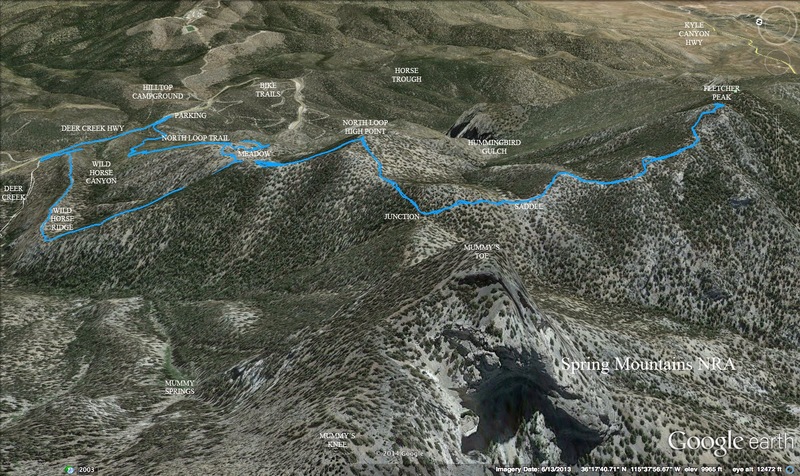 We started at the Mary Jane Falls trailhead parking lot and hiked up the 0.8 miles of the approach trail. At the end of the approach, where Mary Jane Falls trail turns off to the right, we continued hiking straight and connected with the trail that leads to Big Falls Canyon on the left. Avalanche Canyon heads straight up toward Mt. Charleston, but finding the correct wash was a little confusing since there is so much debris scattered about. Nevertheless, we eventually found the right trail after taking a small side trip into Big Falls Canyon and up we went. The bouldering was, at best, a moderate effort and we were all very content. When we reached a limestone slab on the left and a wall on our right, we began noticing fossils in a few of the boulders. Not long after this, we came upon a log pile and decided it was time for us to exit stage right! Location Where we Left the Canyon! We thought we saw a small trail but, as it turned out, the trail may have been used by one person! Anyway, we climbed up on the slope to our right. It was steep. It was filled with scree. And, it was steep. (Oh yeah, I said that.) The climb was very difficult but we were promised that there was a small trail at the base of the rock wall above us. Perhaps there is but to find it easily, hikers need to stay in the wash below longer ... until the wash meets the base of the wall. At any rate, we finally made it to the wall and began circling around. The first interesting thing we came to was a fire pit built with stacked rocks. This location has a view of Mt. Charleston on one side and a view of Kyle Canyon on the other. Next, we came to a cave / shelter area. It was around 100 feet in length along the wall base. We sat here for our break and told the story about the last time our club had done this hike. It was the day of the big storm right after the fire in Kyle Canyon last year. Our hikers sat in this cave watching the rain until they realized that it was not going away. Thunder and lightening were fast approaching so the group decided to head straight downhill and to the cars as fast as possible! On the drive back down Kyle Canyon Rd., flooding was already occurring. They were very lucky to get out in time before the water destroyed some of the pavement. They said that the water in Kyle drainage was almost black from the fires' ashes. So, after our break, we continued around the corner and started losing elevation in the steep scree slopes. We soon found another cave that was even bigger than the first. This one had little stalagtites on the ceiling. Next, we dropped below a rock point which meant that we needed to reclaim that elevation after we got around it. The terrain was still very difficult. As we slowly climbed the loose scree, we passed yet another cave. This one, seen to the left, was a small one that fooled us from below, at first, into thinking it was the Mary Jane cave. But, NOOOO! More loose scree climbing and ... finally ... we came to the Mary Jane cave. By this time, the seven of us were pretty spread out. We waited at Mary Jane Falls until everyone showed up ... minus one hiker that decided to descend straight down to the switchback trail. Our adventure du jour was almost over. All we had to do was descend the switchbacks of the regular Mary Jane Falls trail and continue down to the cars on the approach trail. By this time, there were several recreational hikers making their way up in the pleasantly cool air. Difficult morning? Yes. Did we have fun? Heck yeah! Shout out to the Pre-Hikers! Thanks! Ten and a half miles up Lee Canyon Road from Hwy 95, there is a chain link fence on the left side of the highway that surrounds solar panels and other paraphernalia. Just behind this array, there is a newly installed trail down into Lee Canyon and two routes beyond. 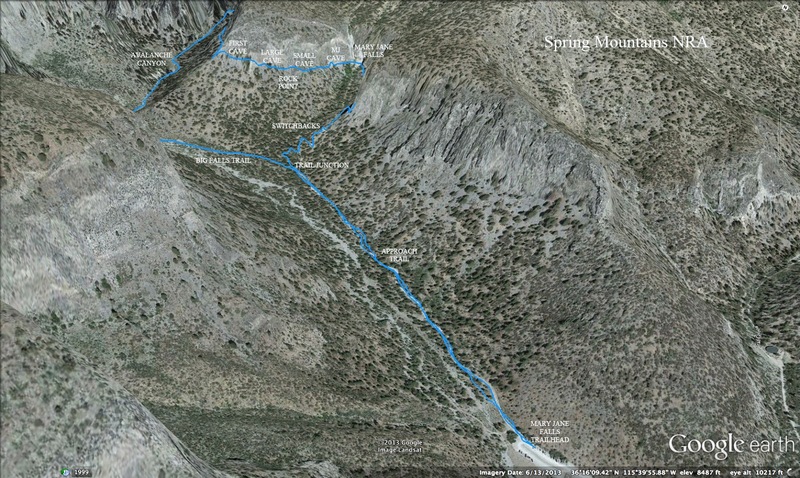 Today, thirteen hikers dove into the canyon that runs alongside the highway using this trail. Very soon, the trail junctioned perpendicularly. We turned to the right and began our hike up the deep canyon that seemed to be a world unto itself. The junction area is seen in the photo to the left. For around 3/4 of a mile, the newly installed trail was very nice and included huge rock cairns that marked the wash crossings. After this, we had to follow red or orange flags that marked where the trail would eventually go. As we neared the narrows, the flags disappeared and we followed an old established trail. At one point, we lost the trail and had to trudge up the gravel wash. (The map below indicates where the trail exists and not what we did today.) 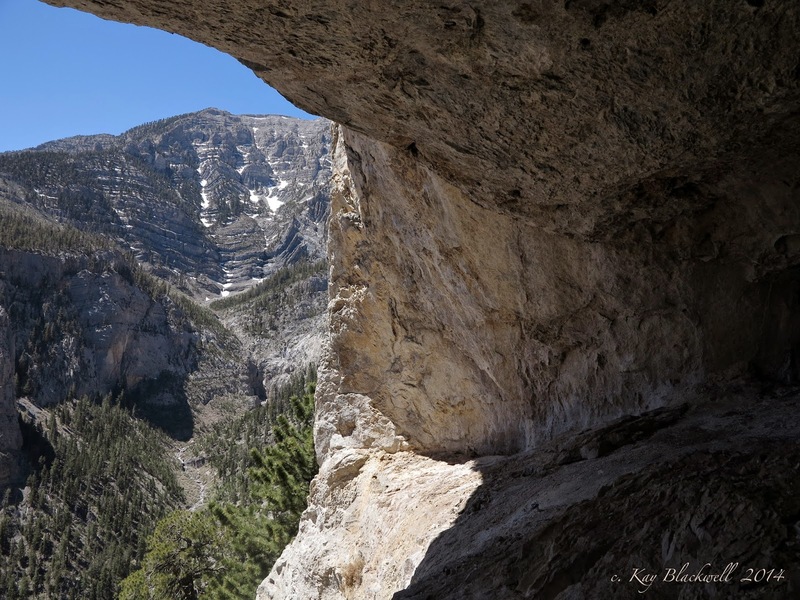 Anyway, when the trail is completed, the hike up through the canyon will not involve route finding! When we reached the cairns in the photo above, we knew we were just below the narrows. We crossed the canyon and began our first steep climb of the morning on the trail that leads up and around the slot. 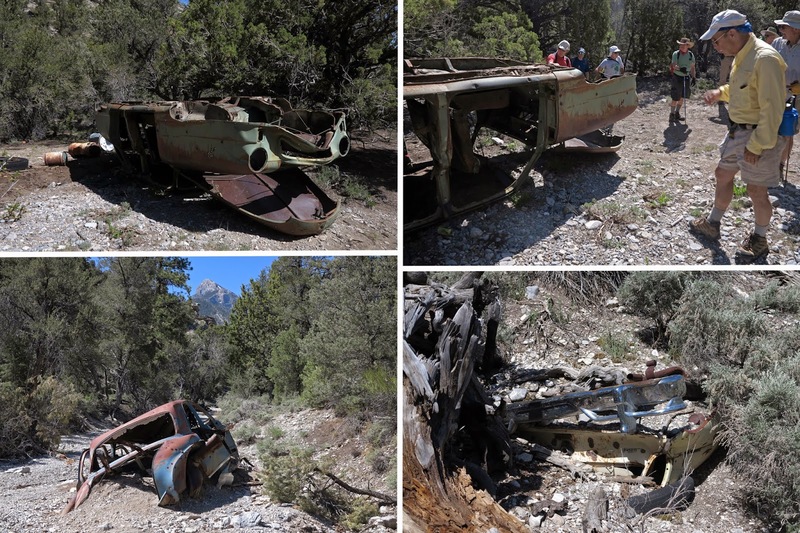 On the other side of the hill, we soon found ourselves at the antique wrecked cars. The first one was a Packard (1940ish). Someone has recently turned this one over onto its top. The second one was over on the side of the wash to our left. 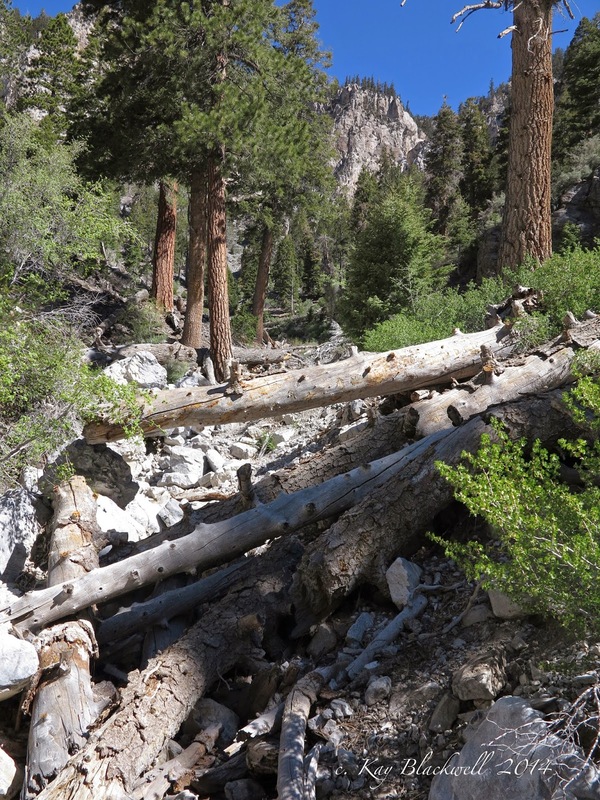 And, the third one is almost buried underneath the trail that would take us up and out of the canyon. We visited each of the cars and marveled at the chrome bumper of the last one. A "real bumper!" 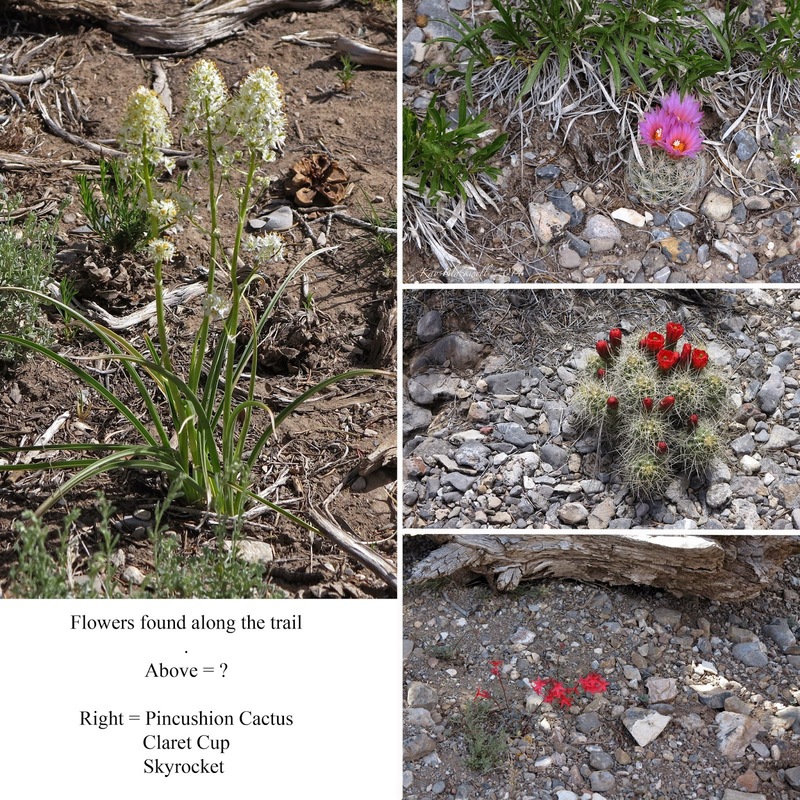 As we wandered around in the canyon and hiked up to Sawmill Ridge later, we saw several flowers that are unusual to catch in bloom. If anyone knows what the white/yellow flower is above, please write a comment! 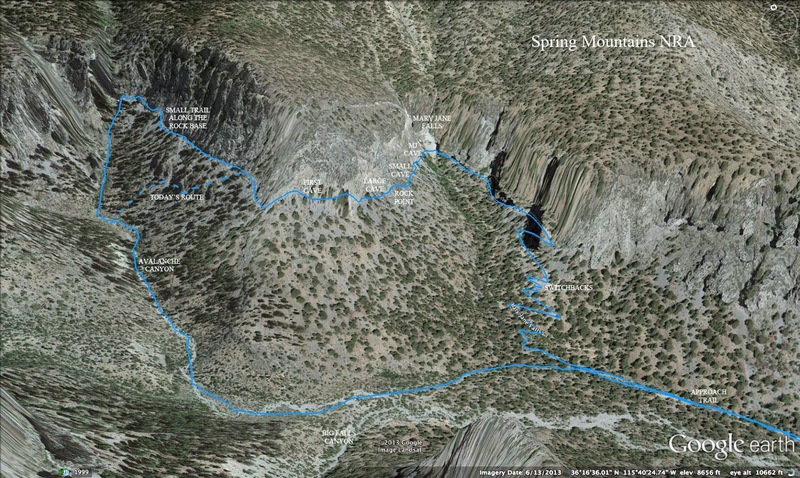 So, we climbed the trail up out of the canyon to the right, connected with the Cardamine Road that leads into the Sawmill Trailhead picnic area, picked out a couple of tables and sat down for our break. (It was nice to have restrooms at our break spot!) We were only 3.25 miles into an 8 mile hike but there were only 200 feet of elevation gain left before we reached the high point of the day. The remaining mileage would be basically downhill. We finished our break and headed out on the regular Sawmill Trail found near the upper restrooms and picnic tables. The first part of this trail is very wooded and shaded. It winds around for a distance then we took the Red Trail fork to the left and started a steeper climb up to the ridge. Views of the surrounding landscape were plentiful up there. Mummy's Nose, the Spring Mountain Divide, Mack's Peak, McFarland Peak, Bonanza Peak and Willow Peak all were present and accounted for. The ridge gifted us with a cool breeze for which we were thankful! As we topped the ridge and began hiking down the gentle slope on the other side, we could see the desert playa far below. On this section of the hike, we passed another hiking group, three horse and riders and a small group of people that pierced the air with their singing! Not sure what that was all about but it was clear that many people were in the Spring Mountains celebrating the Memorial Day holiday. Needless to say, we didn't see any wildlife all morning. They were probably running for the hills! We circled around to our right and began a somewhat steep descent. Just before we reached the part of the trail that is really steep, we found our Blue Trail junction to the left. This is the beginning of the "Sawmill Wiggles." 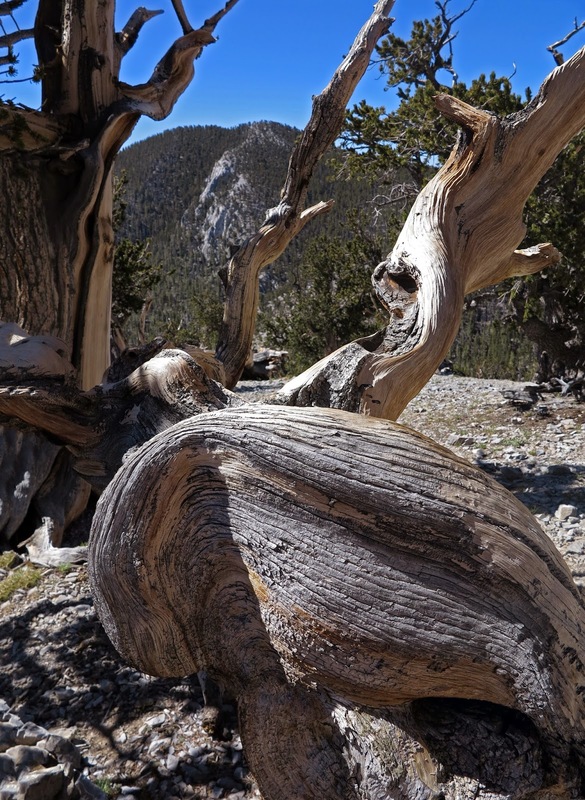 It is a beautiful trail lined with old growth juniper and pinion pine. The route switchbacks here and there as we made our way gently down a ridge then the following slope. Near the bottom, we crossed a dirt road onto a smaller trail and continued to drop until we were in the road/wash area near Blue Tree Campground. At around 3/4 of a mile up from the cars, the hiker has a choice of routes. 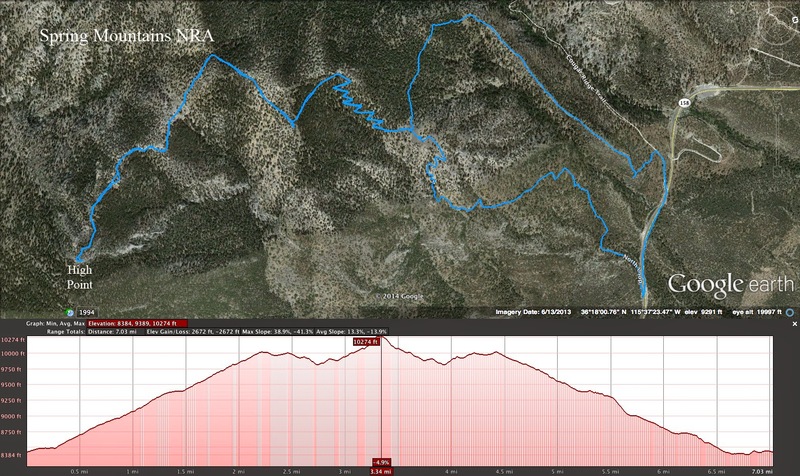 It is slightly shorter to go ahead and bushwhack over to the highway and take the old Lee Canyon dirt road down to the trailhead. 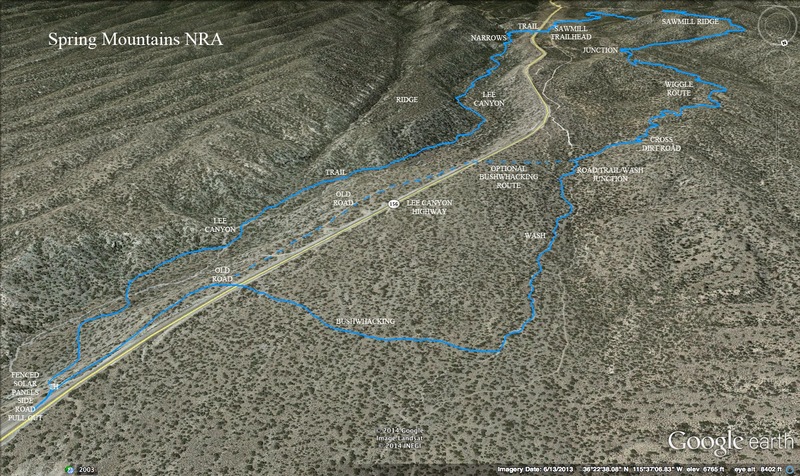 However, a more pleasant route is to hike down the road or the wash and begin bushwhacking later. We chose the wash, then were left with a slightly longer bushwhack over gentle terrain to the cars. 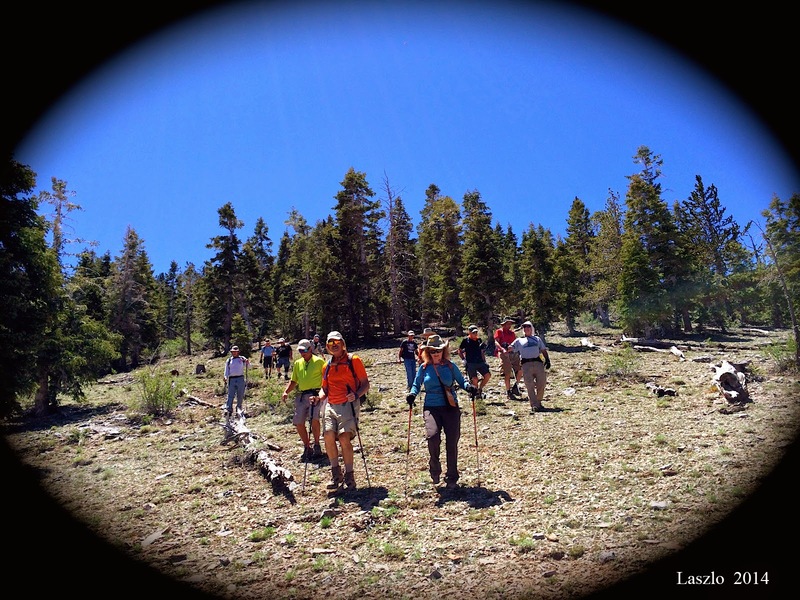 We all enjoyed our 8 miles and will likely be repeating this hike in the fall.